The Messenger accepts many sizes of advertisements. Chances are the artwork that you are currently using with other print media outlets will work in the Messenger. Looking for an economical way to sell a car or fill a job opening? 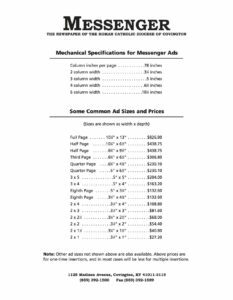 The Messenger accepts Classified Advertising. Simply contact our advertising manager, Kim Holocher, at (859) 392-1500. The Messenger is delivered weekly — 44 times a year — to over 26,000 Catholic households in the 14 counties of Northern Kentucky. The Messenger is mailed via the United States Postal Service and is hand delivered to mailboxes, not thrown in driveways or bushes. Messenger advertising rates are an excellent value when compared to other print media. Advertiser is to be billed at the end of each month in which the ad appears. Invoice is to paid within 30 days of date of the invoice. Ads unpaid after 30 days of billing date will be charged 1.5% interest per month. Advertiser may change ad copy, but may not reduce the number of inches or the frequency of insertion without forfeiting the rate stated in the advertising agreement and paying the rate applicable to the actual amount of advertising done from date of the contract. This amount is due within 30 days of billing date. Position of advertisements is at the option of the Messenger. Deadline for publication is noon Wednesday preceding the week of publication (nine days before date of issue). Ads cannot be cancelled after that time. Ad copy is subject to approval by the Messenger. The Messenger reserves the right to reject any advertising deemed objectionable or contrary to Church teaching or diocesan policies in subject matter, content, phraseology or composition. Final approval rests with the Messenger’s editor and/or publisher, and not with individual sales representatives. Actions taken or expenses incurred by a potential advertiser before final approval of an advertisement is given are not the responsibility of the Messenger or its staff. Political ads are subject to the Messenger political advertising policy, and must be paid in advance. 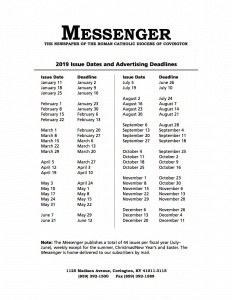 It is the policy of the Messenger, the official newspaper of the Diocese of Covington, Kentucky, to accept for publication political advertisements (hereafter referred to as ads) from all candidates for political office and their supporters. Acceptance for publication of an ad does not signify endorsement by the Messenger, nor does it signify endorsement by the Diocese of Covington, the bishop of the diocese or any other official of said diocese. Ads may not include information that may be construed as an endorsement by the bishop of the diocese or any other official or organization of said diocese. Ads may detail candidates’ biographical information, qualifications, accomplishments, party affiliations, positions on issues and endorsements. All ads shall be submitted and paid for in advance of the publication deadline, which shall be no less than seven days prior to date of publication. Political ads are priced at the standard rate in effect at the time of ad placement, based on the most current Messenger advertising rate sheet. All ads shall identify the name and address of the person or committee paying for the ad. Each ad shall include the following statement at the very top of the ad: PAID POLITICAL ADVERTISEMENT — NOT AN ENDORSEMENT. This statement shall be in all caps, bold print, at least 10 point font size. Nothing in this policy shall be construed to prohibit The Messenger from, and The Messenger commits itself to, full and vigorous use of its news reporting function in aid of voter education and the responsibility of citizens to examine the positions and records of candidates and political parties.